Stable URIs with embedded subject line. No purely numerical indexes without meaning.. Written under a GNU/Linux environment, this script should work on any platform supporting PHP; should you use it successfully on anything else than GNU/Linux, please let know the developer so that this info becomes public. Note that the ptaff.ca certificate is self-signed; it's possible that you get a warning — you may safely ignore it. Creates in /var/www/html/my_list a web archive from the mail1, mail2 and mail3 messages in XHTML. Pages will title the list as "my_list", with "My mail archives" as description. Headers and footers are copied from "samples/before.simple.html" and "samples/after.simple.html". 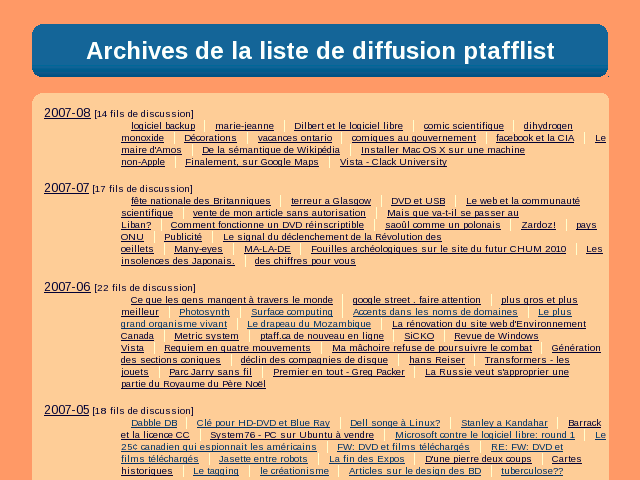 xhtmail is used here on ptaff.ca; you can peek at the french-speaking ptafflist archives. Documentation is available in multiple formats. You can consult the xhtmail's API. xhtmail is free software; you can redistribute it and/or modify it under the terms of the GNU General Public License as published by the Free Software Foundation; either version 2 of the License, or (at your option) any later version. 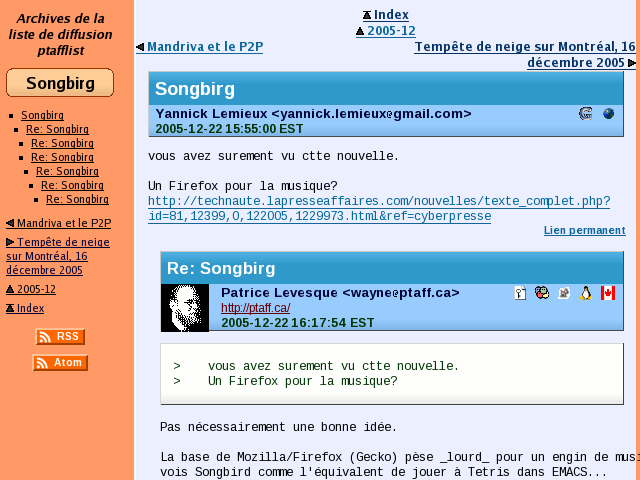 Copyright © 2005 Patrice Levesque. Permission is granted to copy, distribute and/or modify this document under the terms of the GNU Free Documentation License, Version 1.2 or any later version published by the Free Software Foundation.